IMPORTANT UPDATE TO THIS LESSON: On 2015 ACT tests, the Science Test has featured 6 passages (instead of the traditional 7): specifically 3 Research Summaries passages with 7 questions each, 2 Data Representation passages with 6 questions each, and 1 Conflicting Viewpoint passage with 7 questions. Make sure to check your test before you start to see how many passages you have so you can plan your pacing accordingly. 7 passages means you have 5 minutes per passage. 6 passages means you have almost 6 minutes per passage. 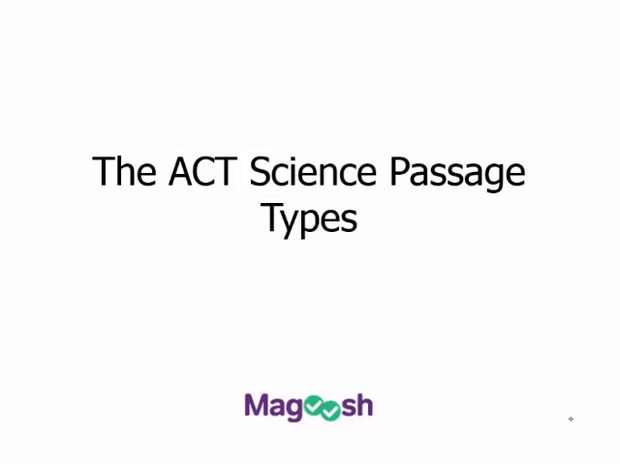 This Magoosh ACT Science video is going to give you an overview of the different passage types that you're going to encounter on every single ACT science test. So, we're going to walk through the structure of each of these passage types that you know how to recognize them and then also point out some different things for you to notice about each of these different passage types. So let's go ahead and get started. Here they are. The three different passage types that you're going to see on a test. So there are data representation passages, research summaries passages, and conflicting viewpoints passage. Now you'll notice this note here about a typical test, so totally you're probably going to see six or seven passages. Now for a really long time, there is always seven passages on the test, but recently students have seen six passages on the test, and it turns out the ACT doesn't guarantee the number of passages you're going to see. Only a specific percentage or percentage range of types of questions you're going to see. So that means that you're probably going to see three Data Representation passages, two Research Summaries passages, and one Conflicting Viewpoints passage based on how things have gone recently. But that doesn't necessarily mean that's going to be the case, so you want to probably, when you open your science test at first, go ahead and flip through the test. See how many passages you have. If you want to, if you're really particular about your passage types, you can see which passage types that you have in there. But you wanna make sure you know what you're getting into, because pacing on the ACT science test is so tricky that it really helps to know how many passages you're dealing with so you know where you should be in the test when you check your watch and make sure you're not running out of time to do the questions that you intended to do. So first up are the Data Representation passages. These passages present scientific information in charts, tables, graphs, and diagrams. The ACT says these are like those you might see in a scientific journal. Most of you are probably not reading scientific journals for a little light bedtime reading. More power to you if you are. So, instead you can think of the charts of results you might see posted in a student science fair exhibit or a high school science lab project. Basically what these passages ask you to do is find, interpret, and analyze information on some charts, line and bar graphs, and diagrams, which you have all likely done in math or science class. What value is increasing, what decreases when you add some more of another element, and so on. The difference between an ACT and your science textbook though is that sometimes on the ACT these figures can look really scary and unfamiliar. But don't worry. You don't need to understand everything that's going on to answer nearly all of the questions you will encounter, and hopefully these Magoosh ACT science lessons will be able to prove that to you. So let's take a look here at how a Data Representation passage is structured. The image on the left of your screen gives you a rough idea. We will typically see some intro text but the majority of the page is going to be occupied by figures. There could be just one, or there could be as many as four or five. Most often there are two or three. And usually, although not always, these are some of the friendliest and most straightforward passages on the test. Because, they typically have more straightforward questions, driven by data you see directly on the figures, charts, and graphs. Often, you will be looking for changes and trends in the numbers. Are they increasing, are they decreasing, are there no discernible trends in the data? Is a line graph spiking in a certain place, etc. More difficult questions are gonna ask you to connect data from different figures together to answer a question. But for the most part, there's not a great deal of higher level scientific reasoning involved in the Data Representation passages. Rarely if ever will we be asked a question on why things were done, or how things were done, or what might change if new elements are introduced. You'll be making some inferences, but they won't be grand leaps. Some students like to tackle these passages first for that reason, so they can snag some points, gain some confidence, and get warmed up. The second passage type you'll encounter on the ACT science test is the Research Summaries passage. A research summaries passage provides descriptions of one or more experiments that could theoretically be conducted by students or scientists. These passages typically include the design, procedure, and results of the experiments or studies. And many of the questions on these passages will ask you to interpret the study design and procedures and analyze the results. So the image on the left side of your screen is just to give you an idea of the layout of a research summary passage. Just an idea, though, they don't all look exactly the same. But generally you are going to see quite a bit more text. You'll see an introductory description of the situation being studied and then one or more related studies or experiments. Because you don't have time to read everything on the ACT science test, it's important to know where to look for key bits of information on a text-heavy passage like our Research Summaries. The purpose of the experiment is generally found at the end of the introductory information. So, take note of it. Usually, right about here. Next, you will find descriptions of several different experiments or studies that scientists or students are conducting. Focus on what is new and different about each one, or what the connection is between them. For example, maybe the first experiment is testing the percentage of carbon monoxide in the exhaust of several different car models, and the second experiment might be building on these findings by testing whether different temperatures impact the percentage of CO in the exhaust. So the connection between these two experiments is that the same cars are being measured and the new element being introduced is the temperature variation. And you can bet that there will be questions asking about what happened as the temperature varied. Harder questions are then going to build on the conclusions of the experiments that are presented, but my suggestion is not to worry too much about understanding the full depth of these studies until you see a question on it. It's just too time-consuming to get wrapped up in. Finally, we have the Conflicting Viewpoints passage. Generally, the Conflicting Viewpoints passage provides two or more alternative theories, hypotheses, or viewpoints on an observable phenomenon. The researchers or student presenting these perspectives may agree on some points, but they always disagree on some major points. And your job is to understand their viewpoints and how they compare. That means this is the one passage on the ACT science test that really relies on your reading comprehension. So as you can see, from my sample passage here, these conflicting view points examples consist of a page of a lot of little x's. I'm kidding, that's text. But there is text, a lot of it, given how little time you have. And you do have to read it, unlike the research summaries or data representation passages. We'll cover reading strategies for the Conflicting Viewpoints passage in another video. But the important thing for you to note here, is to pay particular attention to any similarities or differences between the viewpoints that you notice as you read, because they will definitely be questions on these. And be really flexible on your mindset when you encounter these passages. You might see more than two viewpoints to compare. There might be three. The scientific situation may be very straightforward or it might be more complex. You really just never know. So a lot of students do choose to leave the Conflicting Viewpoints passage for last so that they can focus the attention and the time and the energy they have left on figuring it out at the end. Finally, remember it's answering the questions that gets you the points, not reading the passage. So even though you have to read these passages to understand the gist of them, don't drown yourselves in the text. Be smart, move quickly, and check out our other video on the Conflicting Viewpoints passage for more specifics on this one. All right, so to recap we have three passage types on the ACT science test. Data Representation, Research Summaries, and Conflicting Viewpoints. The key takeaway here for the Data Representation passages is to focus primarily on the figures and the charts that show you the data. They are Data Representation passages after all. That's what they're doing, representing data. On Research Summaries passages, you also want to focus primarily on the figures, but you will be doing a little more interpreting. So you need a bit of knowledge of what's going on. What's being tested? What was concluded? And finally, on Conflicting Viewpoints passages, your focus is to understand the different hypotheses presented. So there is nothing that you can do but read them and understand them. And don't forget, once again, take a look at our other videos for even more specific advice on tackling the specific question types you will encounter on each of these different passage types.